Later this year, Google will be unveiling Chromebooks which will for the first time incorporate touchscreen technology. That will bring Chrome a lot closer to directly competing not only with Microsoft, but with Android as well, as there are dozens of tablets on the market and there will be dozens more by the time the new Chromebooks are available. The new touchscreen Chromebooks do not have a firm release date and we can only guess if Samsung and Acer will continue to build these lean machines going forward. Google has not made much of a dent with Chrome against Microsoft as the search giant continues to position itself to be the go-to solution of integrated cloud computing, which is Chrome’s forte. Google to this point has not expressed much concern about having two competing platforms, and arguably right now, Android and Chrome are not really playing in the same sandbox anyway. However, the convergence of mobile communications, mobile computing and unifying user experiences is not a pipe dream. Since Android and Chrome are both rooted in Linux, it is fair to expect that at some point, Google will want to find a way to bring the two worlds together. Android has no shortage of developers writing applications for that ecosystem. Chrome, being cloud-centric has not had as much of a need, since everything was done on the web. By introducing touch to the experience, Google will have to get some developers on board to make the experience alluring, and program touch-based, cloud-centric applications for the next generation of Chromebooks. It will be interesting to see how Chrome OS is enhanced for a touch environment. Will we see a Chrome tablet sitting side-by-side with Android tablets in the future, or will one platform absorb the other? 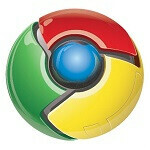 Will this be the first product representing the symbol of a chrome-android statue at Google's offices? Which way do you think Google will steer this development? Sign me the eff up! please no. Just make it android already. Come again? Why would Google even try to compete itself? Aren't there enough competing companies? Sounds like the Chrome Pixel. Maybe it's not just a rumor after all. Hopefully they'll reveal everything at the upcoming Google event.